Every time one of my friends brings up their meditation practice, I quickly reply with something along the lines of, “I wish I could do it, but I can’t focus.” I know that meditation isn’t about perfection, but being type A, it’s hard for me to do something if I’m not “perfect” at it. Lately, meditation keeps popping up in my circle, from badass friends who are constantly hustling to my sheroes like Robin Roberts meditating every day at three-something in the morning, according to an interview with The Cut. I figured if Robin Roberts can wake up that early every morning and commit to a meditation practice, I, too, could wake up (a little later) and get my meditation on. I’m still a meditation rookie, but one thing I found helpful when my mind wanders, which is basically every minute, is mental noting. 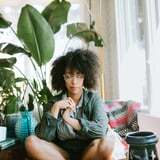 “Mental noting, or labeling, is a mindful awareness technique of noting and naming the thoughts and feelings that come up as you meditate,” Millana Snow, meditation teacher, energy healer, and founder of Wellness Official, told POPSUGAR. “When your mind starts to go off into tangents, you can use mental noting to bring pause and awareness to those thoughts so that you can start to unidentify with them and become the observer of those thoughts and feelings.” If you find your mind wondering, make note of it – “I’m thinking about the big pitch I have on Friday” – then return to the present. Every time my mind drifts and I find myself wondering what I’m going to eat later that day, thinking about how many clients I have to train, planning a trip to Colombia, combing my never-ending to-do list, and every other random thought that comes up, I revert back to mental noting. Some days, I have to do it a lot, but other days, I only have to do it once or twice during my practice. If you’re already going, “Yeah, I still won’t be able to do this,” I promise you, you will. When I catch myself thinking about everything else instead of being in the present, I practice mental noting by focusing on my breath while thinking, “Breathing in, breathing out.” When Millana finds her mind drifting, she said she reminds herself to “‘come back to my breath’ or come back to noting what the moment contains: the sounds in the room, the smells, and the way my body feels. I find this helps me go deeper into awareness,” she explained. The key word in “practice mental noting” is practice. “We must allow ourselves to be the observer of our thoughts, and to watch thoughts pass by like you would clouds in the sky,” Millana said. She also recommends noting and naming your thoughts “instead of identifying with them and making them distractions.” The key is to become more present and separate the thought from yourself. If you gave up on your meditation practice before starting because you thought focus would be an issue, try introducing mental noting into your practice.